Smart packaging is better packaging. High-performance packaging products driven by our know-how. Our experience has led to the development of our Wrapsody line of high-efficiency products covering 80% of packaging applications. If you’re not completely satisfied with your purchase, simply return it for replacement, exchange or refund. It’s our guarantee to you! We permanently stock a wide range of products to ensure we have what you need, when you need it! All-purpose stretch film. Perfect for cold environments. High-resistance film perfect for multiple transshipments. With its outstanding holding force, this film is ideal for unstable and irregular packaging. 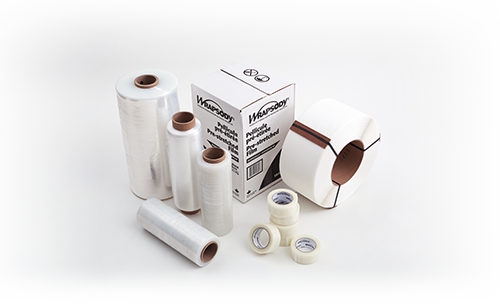 The next generation in high-performance film with up to 250% or more pre-stretch capacity. Light, easy to use and great retention memory. It offers superior performance with reinforced edges for unrivalled tear resistance. This clear, glossy film offers enhanced coverage. Facilitates bar code scanning. Excellent cling for improved puncture and wear resistance. Ideal for difficult-to-handle items and perfect for cold environments. Offers industrial-strength durability – as strong as steel strapping. With its film memory, it returns easily to its pre stretched form. Application is safe, and the anti-corrosion strapping is also abrasion and UV-resistant. Adapts easily to irregular shapes. Can be heat-sealed. Offers greatest elongation. Powerful adhesive for quick sealing of boxes (high or low output). These adhesive tapes offer excellent resistance to temperature, UV rays and aging. Ideal for sealing boxes using a case sealer or other machine. Advanced adhesive properties ensure fast sealing for a flawless result, box after box. We're here to guide you in identifying the product that best suits your specific needs.